Differential Equations is an important topic in the Mathematics syllabus of IIT JEE examination. It is undoubtedly the easiest part of calculus and scoring too. This topic forms the basic chapter in all the books of differential calculus. A differential equation is an equation that involves an unknown function of one or several variables that relates the values of the function itself and its derivatives of various orders. Differential equations play a vital role not only in applied mathematics but also in various other branches like engineering and physics. 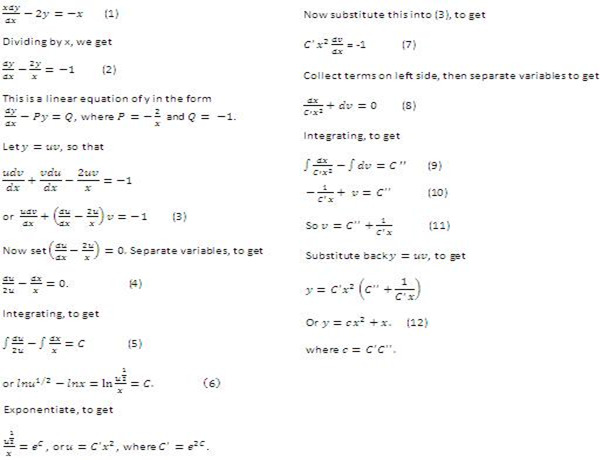 There are various methods of solving the differential equations but they vary with the type of equation. Ordinary Differential Equation often called as an ODE is a differential equation which involves an unknown function and its derivatives. The unknown function which is the dependent variable is a function of single independent variable. In simple words, it can be said that an equation that involves only the ordinary derivatives is an ordinary differential equation. F(x, y, y',…..,y (n) ) = 0, where y is a function of x and y' denotes the first derivative of y with respect to x. Partial differential equations are the equations in which the unknown function is a function of multiple independent variables along with its partial derivatives. Though the order is defined on the similar lines as in ordinary differential equations but further classification into elliptic, hyperbolic and parabolic equations especially for second order equations is of utmost importance. Linear differential equations are the equations in which the unknown function and its derivatives appear in power 1. Such equations do not involve higher order terms or any kind of products. Such a linear ordinary differential equation is said to be homogeneous when Q(x) =0. This should not be confused with the use of the term homogeneous in case of ODE of the form y' = f(y/x). Homogeneous linear equations are also a subclass of linear differential equations in which the solution space is a linear subspace i.e. the sum or multiplications of two solutions is also a solution. Non-Linear differential equations are the equations which involve higher order terms and the products of terms. There are only a few methods of solving non-linear differential equations and even they also depend on the equation having specific symmetries. The fundamental questions of existence and uniqueness of solutions for nonlinear differential equations, and the existence of initial and boundary value problems for nonlinear PDEs is a tedious task. The ordinary differential equations can be further classified according to the order of the highest derivative of the dependent variable with respect to the independent variable present in the equation. Thus there may be first order differential equations, second order differential equations and so on…. x2 d2y/dx2 + x dy / dx +(x2-a2)y = 0. This equation is also called as the Bessel’s equation. In general, an nth order ODE has n linearly independent solutions. Moreover, any linear combination of linearly independent solutions is also a solution. If the general solution to the homogeneous ordinary differential equation is available, then it is possible to find the solutions of the corresponding non-homogeneous form by using the methods of undetermined coefficients or variation of parameters. Order of a differential equation: The order of a differential equation is defined by the highest order derivative. Degree of a differential equation: The degree of a differential equation is defined by the highest power on a variable. d2y / dx2 + xy = x3y3. Now, with the help of illustrations we explain how to solve different types of differential equations. While attempting to solve any such differential equation first try to check if it can be solved by the method of variable separable. A differential equation, M dx + N dy = 0, is homogeneous if replacement of x and y by λx and λy results in the original function multiplied by some power of λ, where the power of λ is called the degree of the original function. If so, follow these steps. Let y=vx, so dy/dx = x(dv/dx) + v.
From M dx + N dy = 0, we have dy/dx = -M/N = f(v), since y is a function v.
So f(v) = dy/dx = x(dv/dx) + v.
Now the variable x and v can be separated: dx/x = dv/(f(v)-v)). Solve the new differential equation with separable variable, then use the substitution y=vx to find y. (3)  If the differential equation cannot be solved by the previous two methods, try to express the linear equation in the form of dy/dx + Py = Q, where P and Q are functions of x alone, or constants. Let y=uv, where u and v are functions of x.
Differentiating, to get dy/dx = u(dv/dx) + v(du/dx). Substituting into dy/dx + Py = Q, to get u(dv/dx) + v(du/dx) + Puv = Q, or u(dv/dx) + (du/dx + Pu)v = Q. Determine u by integrating du/dx + Pu = 0, where the variables are separable. Then use the value of u obtained to find v by solving u(dv/dx) = Q, where, again, the variables are separable. Finally, use the substitution y=uv to find y.
xdy / dx -2y = 2x. To get an idea about the types of questions asked you may refer the Past year Papers.